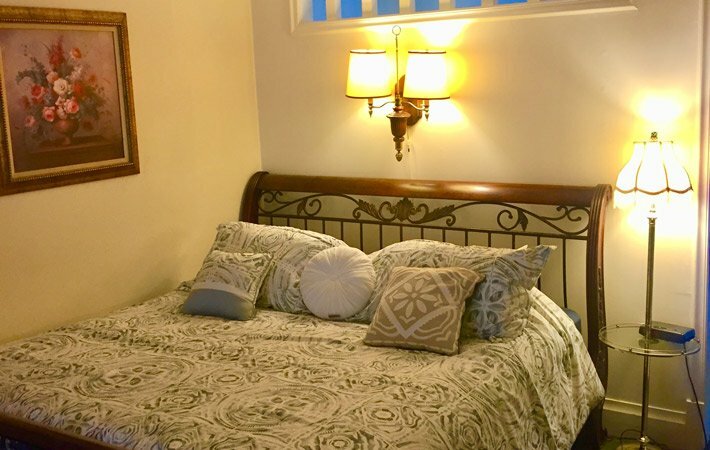 YOU CAN VIEW EACH OF OUR BEAUTIFUL GUEST ROOMS BELOW. Please call us at 916-425-9360 to book a room or to inquire about any particular accommodations, special promotions or seasonal rates. PLEASE BOOK RESPONSIBLY! WE HAVE A 1 WEEK CANCELLATION POLICY. If you cancel within one week of your reservation we will not be able to refund your room stay. This room is located upstairs and inside the mansion. 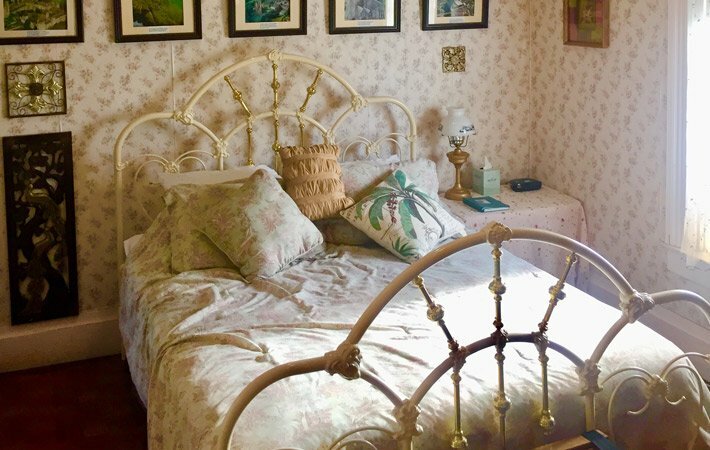 This 108 year old historic bedroom was the original master bedroom of the house and is located at the top of the front lobby staircase. 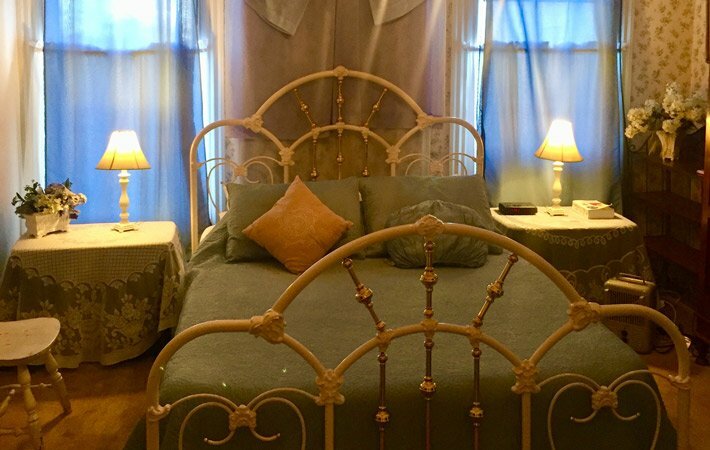 The room features a four-poster queen sized victorian bed and antique armoire. A sitting area near the bay window offers a view of Downtown Auburn. 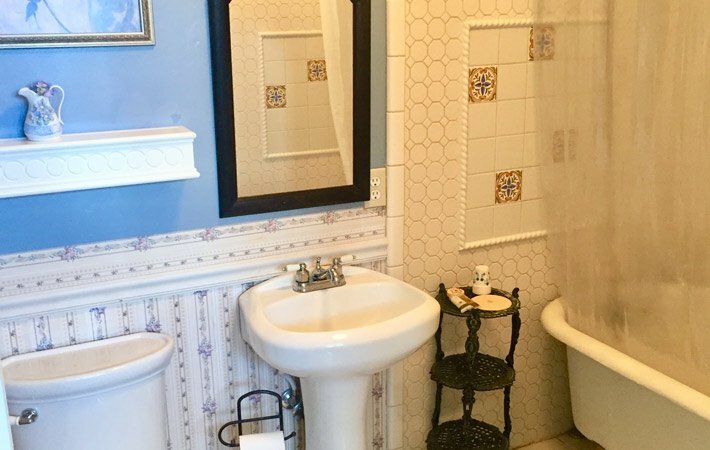 There is an antique claw-foot bathtub and shower within the room and private water closet. This room also features DISH satellite television. The room has its own heating and air conditioner control. Your room rate includes a delicious breakfast for 2 served at 9:00am in our dining room. PLEASE CALL FOR SEASONAL RATE SPECIALS & ROOM AVAILABILITY 916-425-9360. This room is located inside the mansion upstairs. 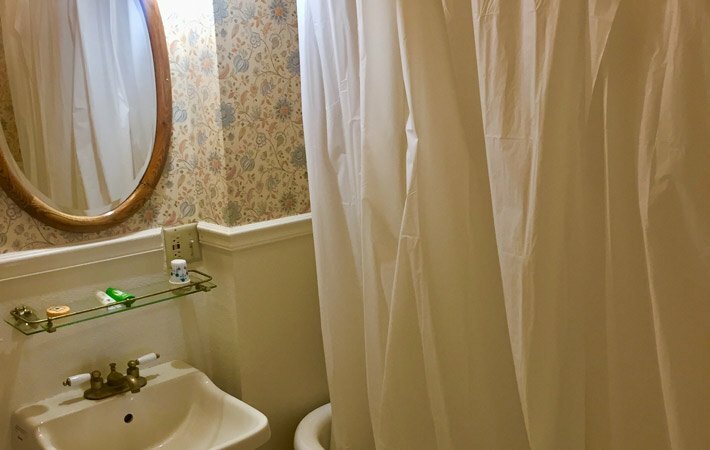 This historic room features a queen sized white enamel bed and private bath with an antique claw-foot bathtub and shower, as well as an old-fashioned "pull" toilet. This room features a "nautical" theme. When James Vissel Power (the grandson of the Honorable Harold T. Power) was 45 years old, he retired! He purchased a grand sailboat and sailed for 6 years with his lovely wife Liz. What an adventure! Jim and Liz returned from their trip and purchased the original gold mine property located in Foresthill. 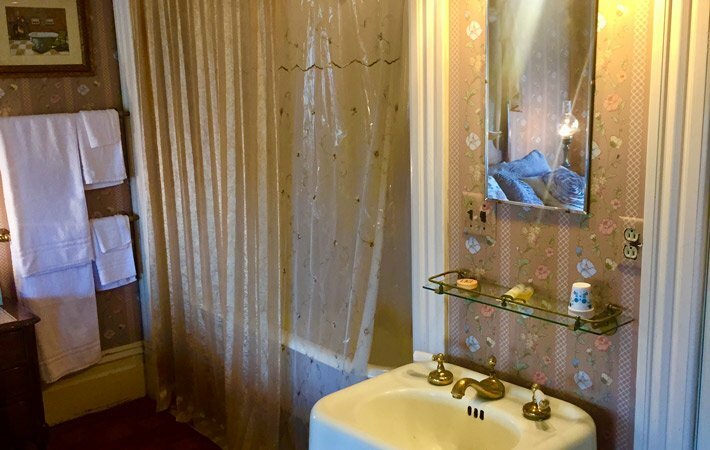 This room comes complete with queen sized bed, antique European armoire, satellite dish television, private telephone and private bath with a giant claw foot bath tub. This room is a commemoration to the Chinese laborers who played an integral role in the Power's mining operations as well as the building of the mansion. 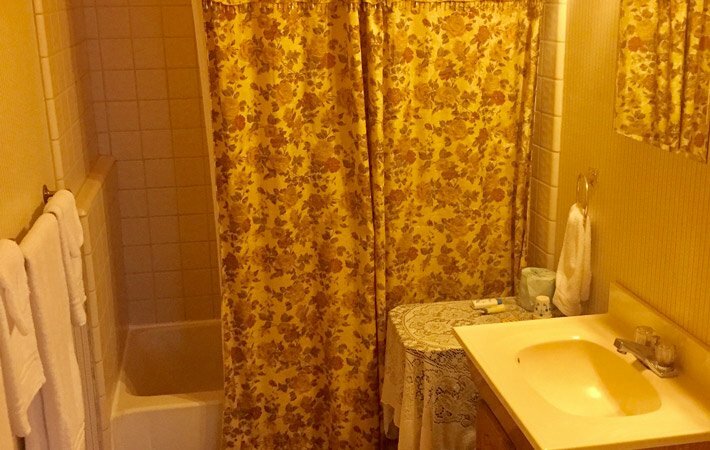 Comes with a Queen size bed, armoire, and private bath with sunken tub and antique water closet. This room is a commemoration to the Irish Immigrants who played an integral role in the Power's mining operations and in the development of the history of Gold Country. 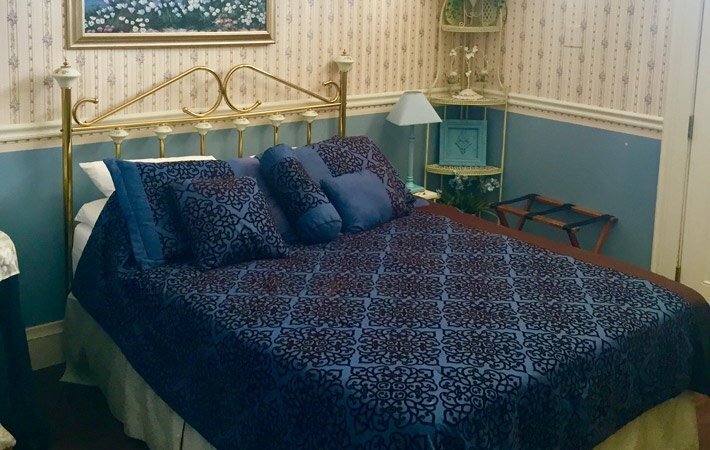 This room comes with a queen size bed, armoire, satellite television, and a private Jacuzzi bath tub with shower. This room is located inside the mansion, off the kitchen and downstairs. 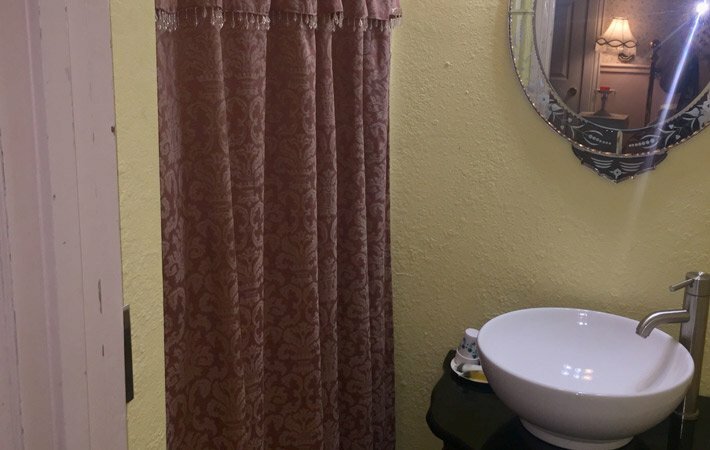 This historic room features a queen sized brass bed and private restroom with a shower, as well as an old-fashioned sink. 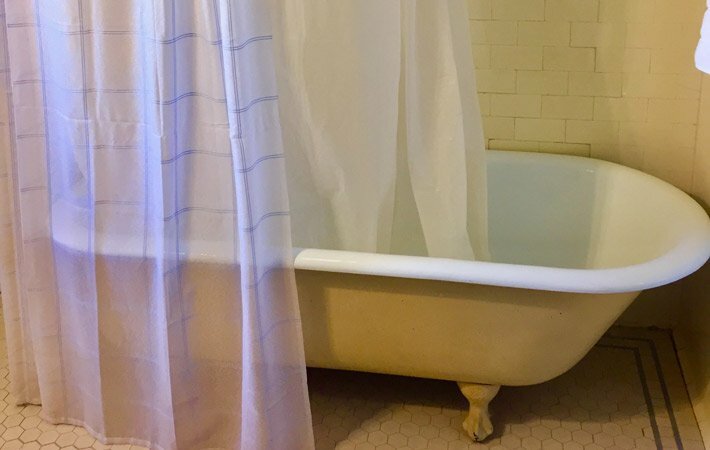 This room has its own private standard bathtub and shower, Television, phone and is located inside the mansion downstairs. 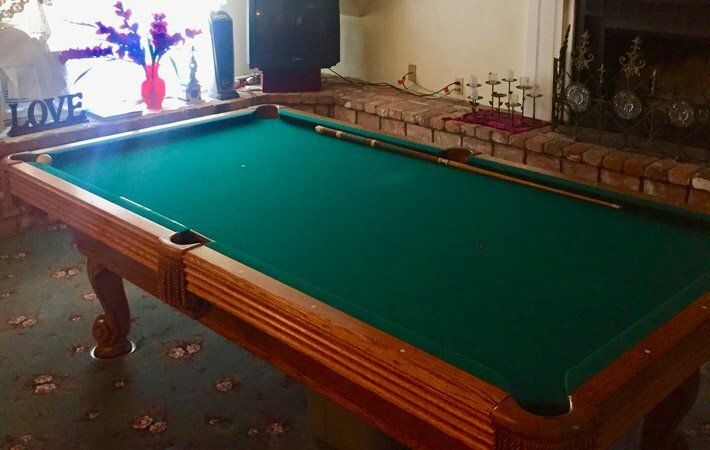 It has its own private entrance to an outside deck and garden area. This room is located inside the mansion downstairs. 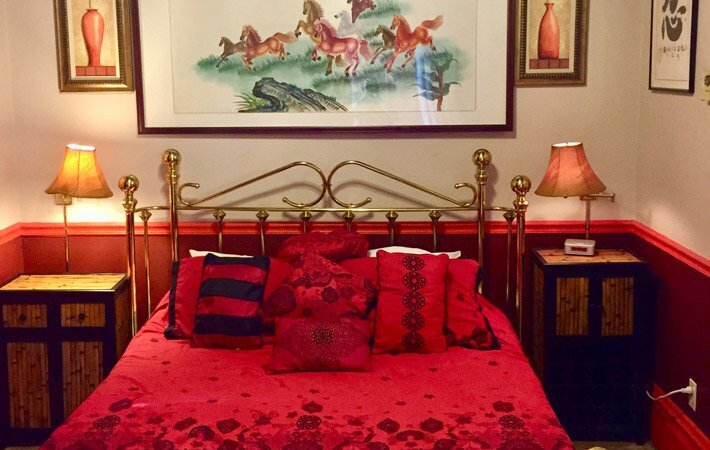 This historic bedroom has been upgraded with a beautiful "majestic and opulent" burgundy and black theme. 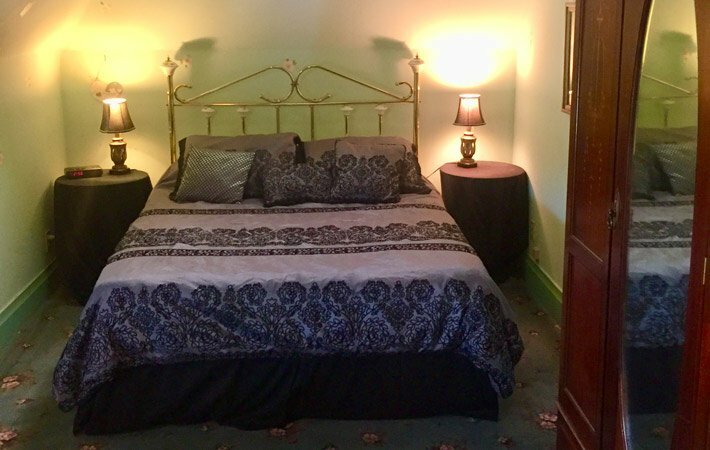 The room features a queen sized black iron victorian bed and black antique armoire. 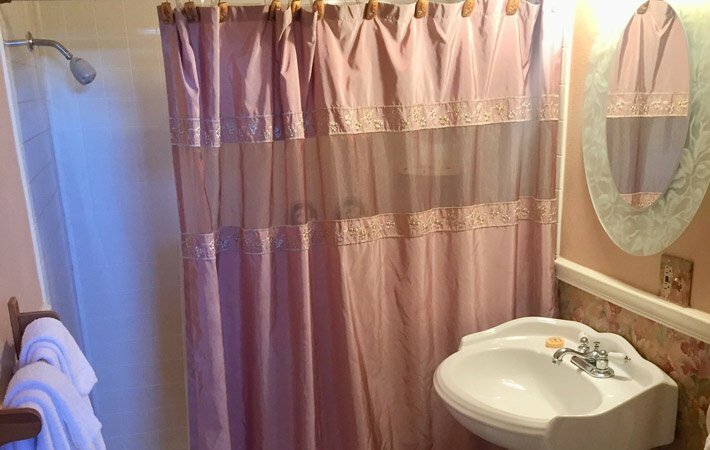 The walls are decorated with "rich" burgundy wall paper and blended pastel colors and trim. 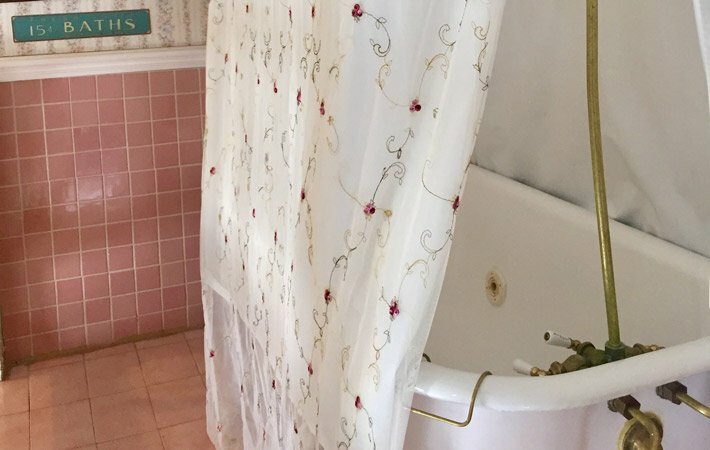 This room comes with its own private bathroom and extra large shower. This room also features its own telephone and satellite television. 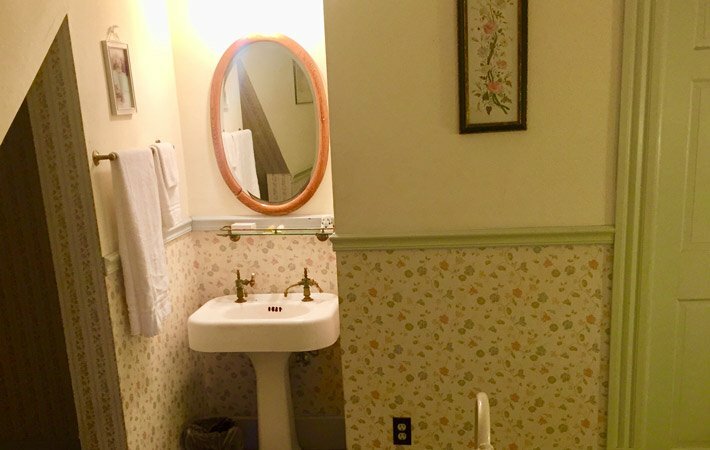 This newly re-decorated room is light and airy and captures the feeling of "Spring time". 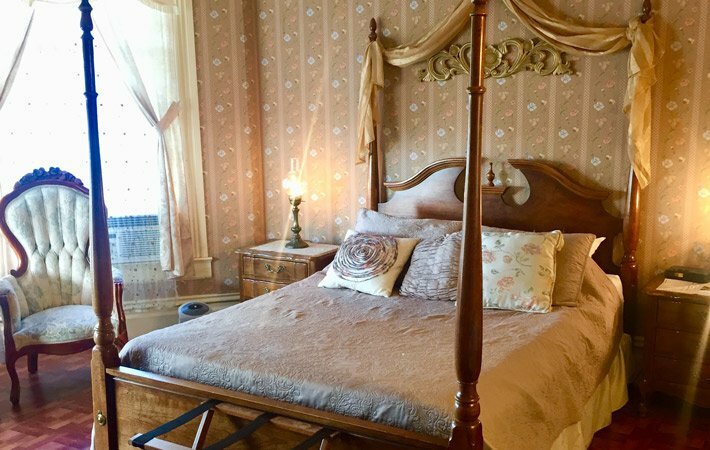 The room features an antique queen sized brass Victorian bed and antique armoire. 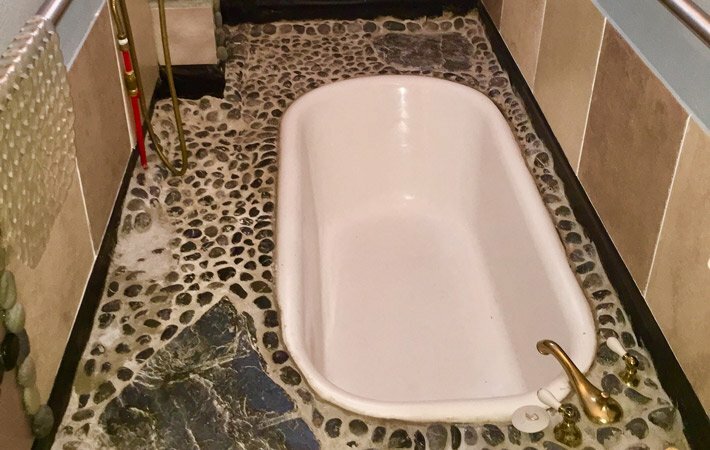 There is private bathroom with an antique claw-foot bathtub and shower within the room. This room also features its own telephone and satellite DISH television. This room is located on the second floor along the outside wrap-around porch of the mansion. 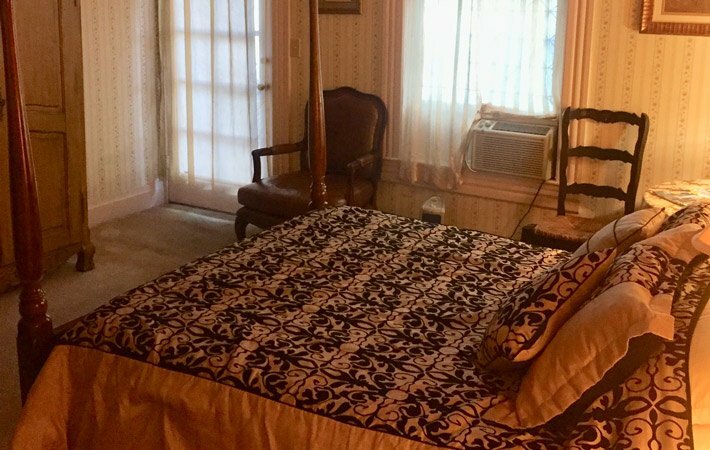 The Historic Power's Mansion Inn is a "Family Friendly" bed and breakfast. 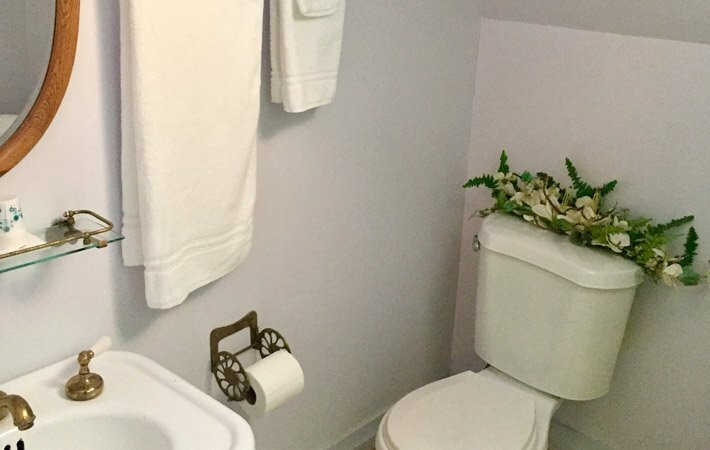 As such, this room includes two queen-sized beds, a private telephone, personal refrigerator, microwave, satellite television, private bathroom with shower, an antique European armoir and a private entrance. This beautiful room features the simplicity of an "old-style" queen sized European style brass bed, an antique "quarter sawn" armoir and dresser with mirror imported from Europe in the late 1800's. The Room entrance is off a wrap around porch that faces the Victorian Gazebo underneath the 100 year old oak. 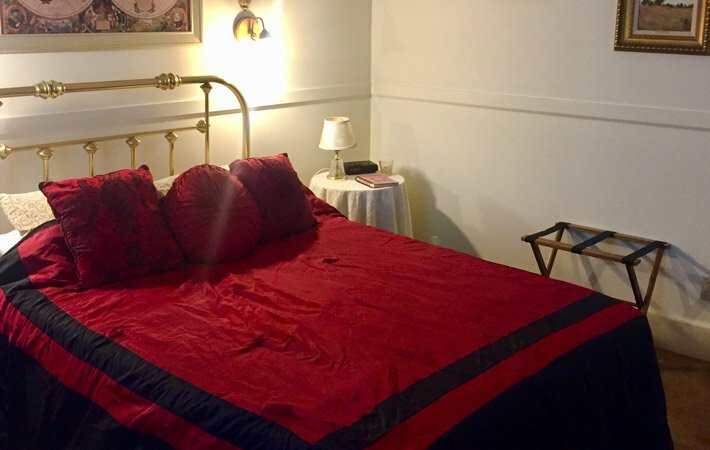 This room comes with its own private entrance, has its own full size bathroom, queen sized bed and features its own telephone and satellite television. 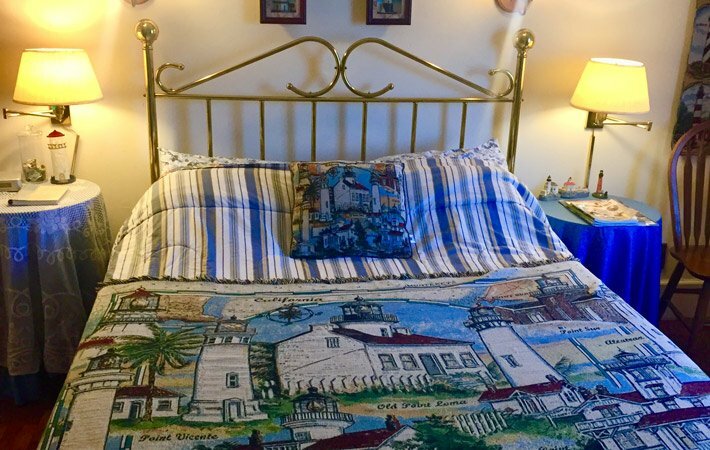 This beautiful room features a "touch" of New England with nautical & lighthouse themes throughout. The Room entrance is off a wrap around porch that faces the Victorian Gazebo underneath the 100 year old oak. 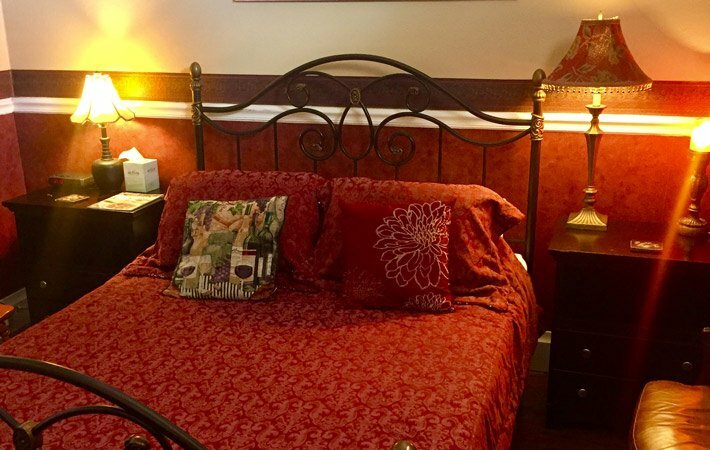 This room comes with its own private entrance, has its own full size bathroom, queen sized bed and features its own telephone and satellite television. This room is located at the top of the wrap-around porch. 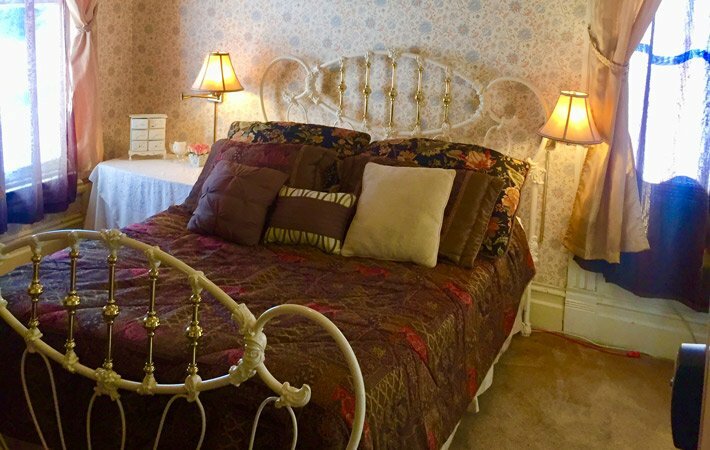 This cozy historic bedroom will bring back nostalgic memories of visiting Grandma's old house. With its blue colored walls, antique television and checkered bed quilt, you'll step back in time to a slower more relaxed pace. 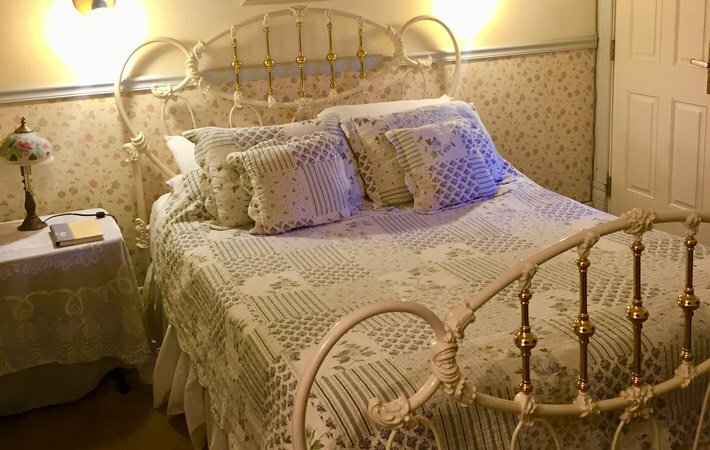 This bedroom is located at the top of the wrap around porch and overlooks a garden area. 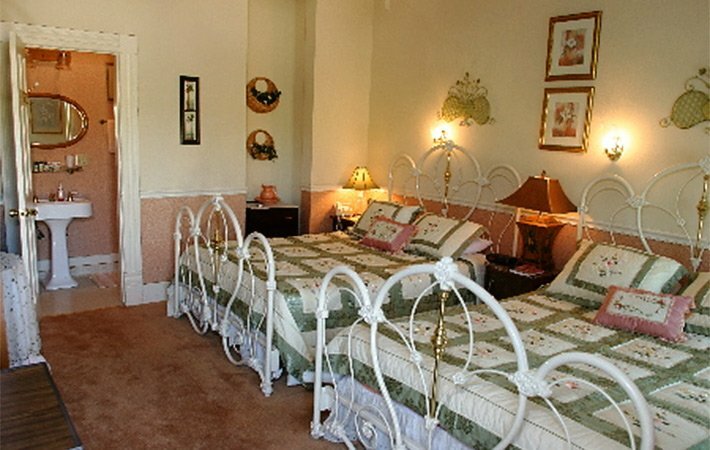 The room features an antique queen sized victorian enamel/brass bed and comes with its own private bathroom with shower. This room also features its own telephone and DISH satellite television. This room is located on the third floor along the outside wrap-around porch of the mansion. This beautiful room features a queen sized bed that looks up to the Mansion's unique ceiling architecture and two skylights. 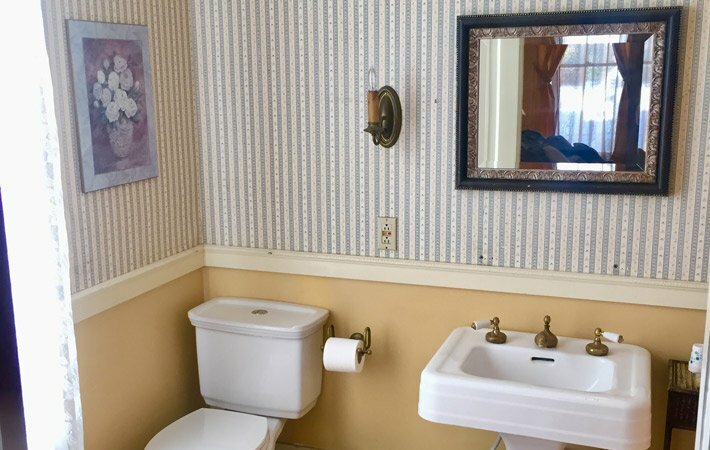 The room comes with a wood burning fireplace and its own private bathroom with an antique claw foot bath tub. There is a romantic seating area for two that overlooks a beautiful victorian gazebo garden and 100 year old oak tree. 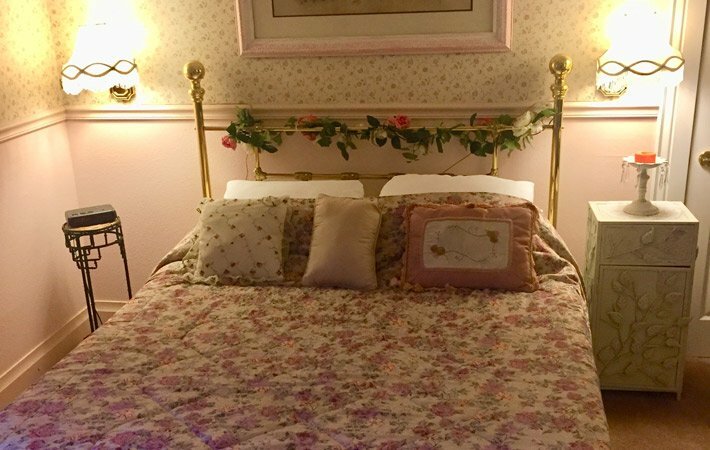 The Anniversary Suite also features an antique European armoir for storing your clothes, a private telephone and satellite television. 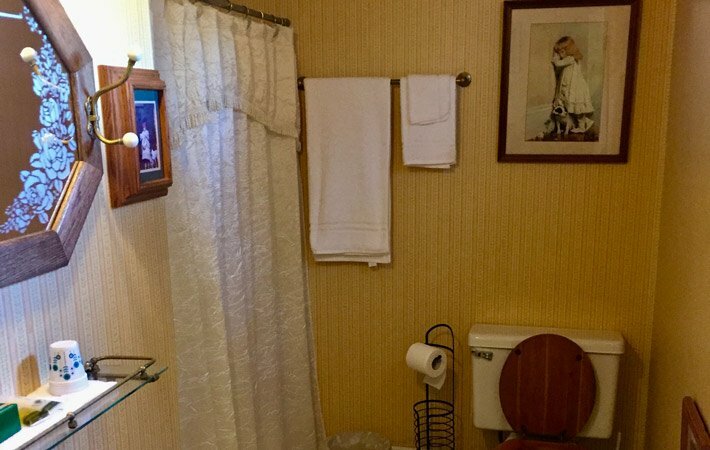 This room comes with its own private entrance. This spacious suite features unique roof line architectures and a charming wood burning fireplace. 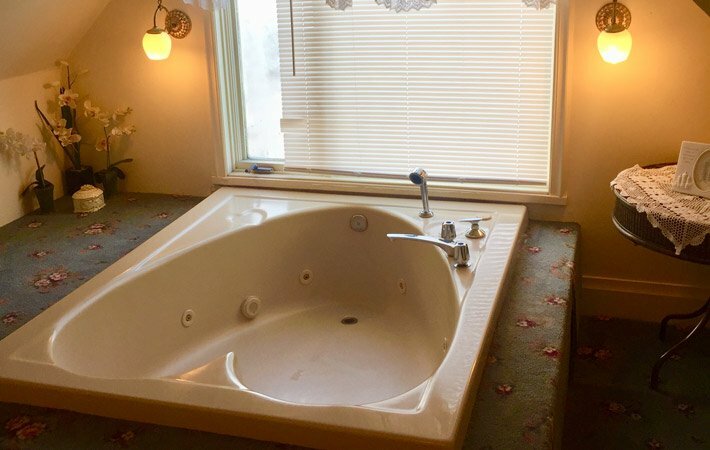 An antique European armoir, seating area with heart-shaped chairs and a heart-shaped jacuzzi bath tub are among the many pleasures available for your enjoyment. 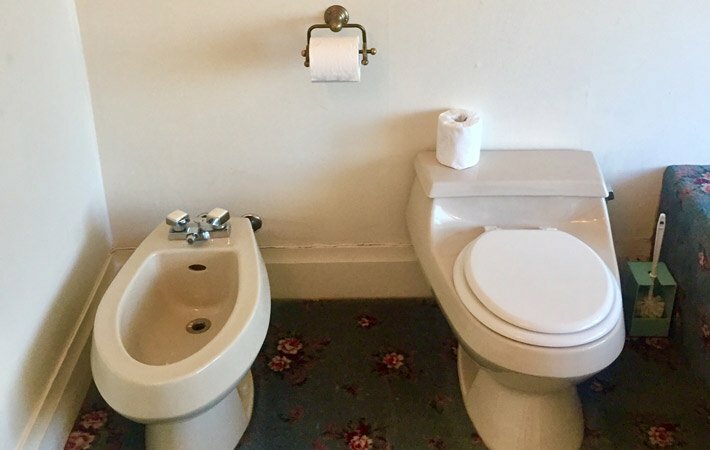 This Honeymoon suite also comes with Dish Satellite Television and private telephone.